A versatile and well-developed vocabulary is a vital component of 11 plus and Common Entrance exams but is often one of the more difficult to attain. 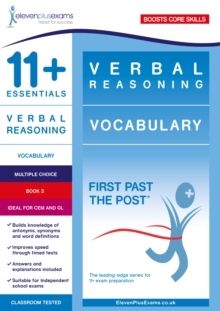 This collection of multiple choice tests, based on conventional classroom testing sessions, is representative of the verbal reasoning type questions of multi-discipline CEM style 11 plus exams. A range of vocabulary topics and question styles identify and drill the use of synonyms, antonyms and homonyms providing the confidence to answer questions that test and explore vocabulary. Extensively road-tested by Eleven Plus Exams, all 11+ Essentials tests are best used as real exam practice to benchmark a child s performance and to identify areas for improvement. The suggested time for each paper is based on data obtained from conventional classroom testing sessions. Includes a broad coverage of antonyms, synonyms and homonyms to develop vocabulary. Provides ample training for any level of 11 plus exam and familiarisation and realistic practice ahead of the tests to build knowledge and confidence, and ensure success. .